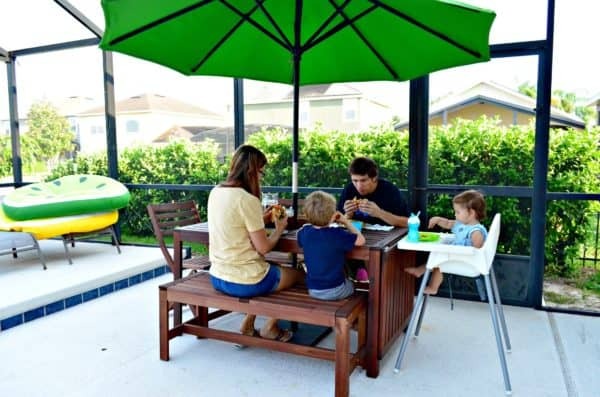 There is nothing more that we love to do then sit on our pool deck and enjoy dinner outside! This is the time of year where you can find my family eating outside for lunch (on the weekends) and dinner just about every day of the week. My four year old son likes to call it a family “picnic”. 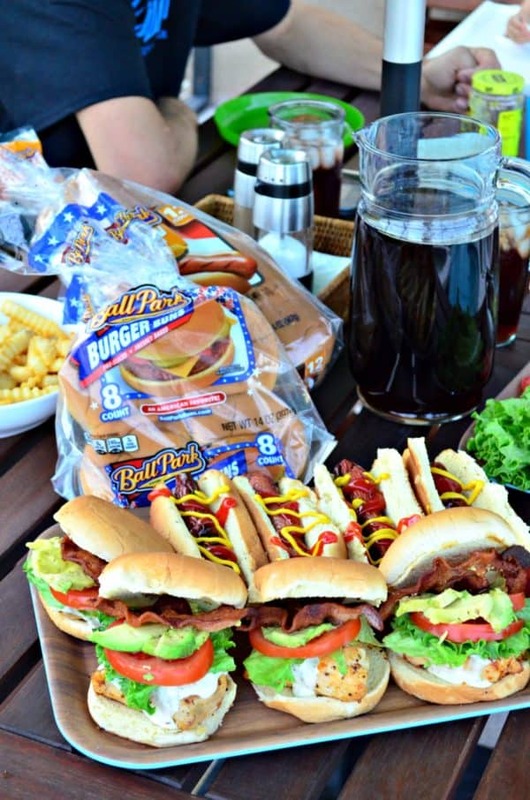 Tyson®, Lipton®, and Ball Park® products make bringing dinner outside easy! I’ve been making these Grilled Chicken Cali Sandwiches for a while now and I’m excited to share this easy recipe. I was able to pick up all my ingredients at Walmart. They have everything I need for a variety of summer occasions. Best of all, my local Walmart offers grocery pick-up! I placed my order online and the next day on my way home from preschool pickup I just swung by and the nice associate loaded up my car! I have friends that use this service all the time and I’ve yet to try it. I finally gave it a try and I’m sold. Why haven’t I tried this before?!?! My produce was fresh, and all my items were sitting in my trunk. They even show you the substitutions they made and will remove them off if you don’t want them. Let’s talk about these sandwiches! The recipe starts with Tyson® Chicken and garlic and herb seasonings. I grill the chicken and while the chicken is grilling I go inside and slice tomatoes, wash and dry lettuce, and cut slices of avocado. I try to have pre-cooked bacon on hand, but if I don’t I’ll fry up a few slices at this time. Once the internal temperature of the chicken reaches 165, I throw on the Ball Park® Burger Buns on the grill in indirect heat to toast them. I remove the buns and place the chicken on each bun. I top each burger with a tablespoon of ranch dressing, lettuce, tomato, bacon, and avocado. 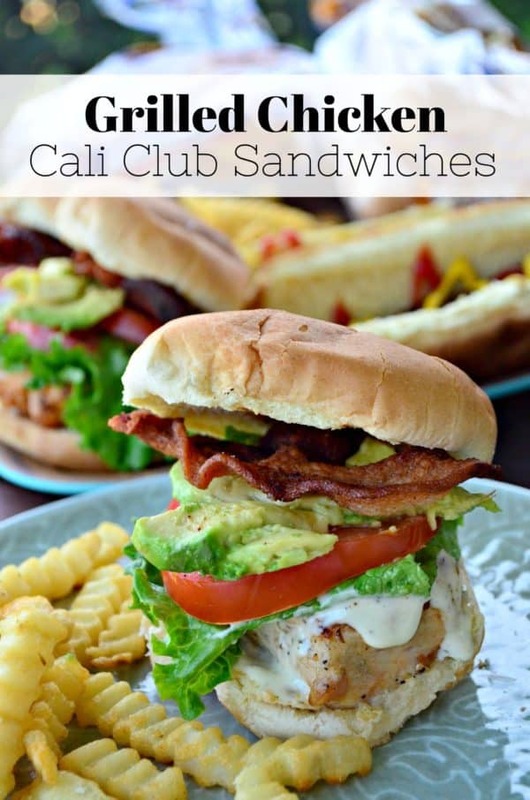 In less than 30 minutes you’ll have the most delicious grilled chicken cali club sandwiches around! 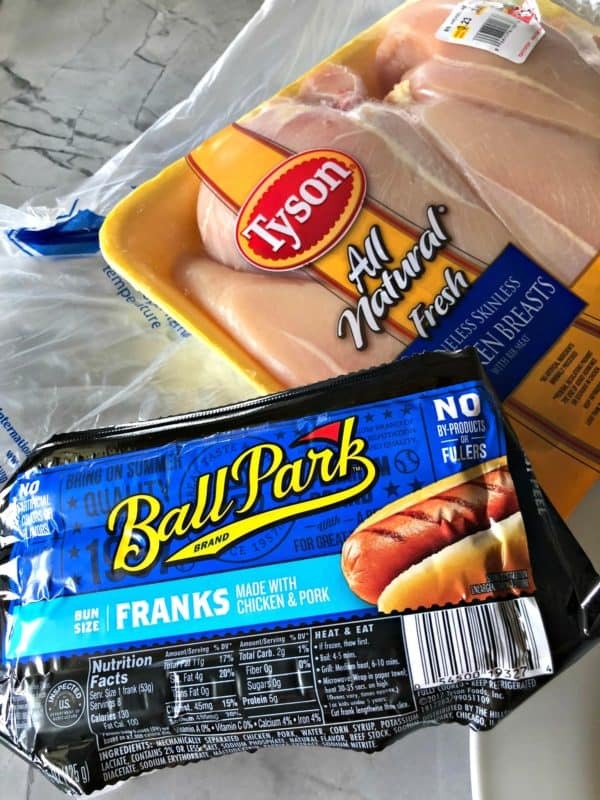 My son likes the chicken sandwiches deconstructed, so I like to throw a few Ball Park® Hot Dogs on the grill for him (and my husband too)! 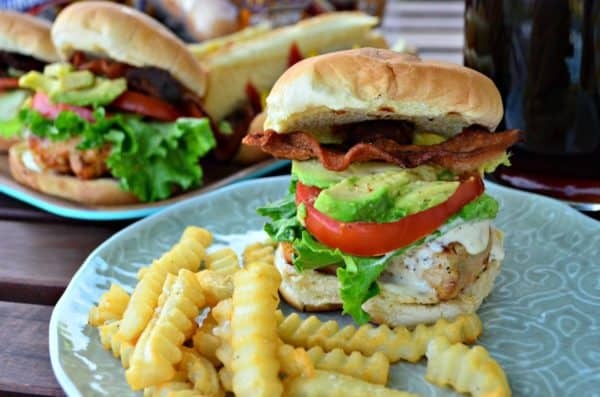 Our Grilled Chicken Cali Club Sandwiches and grilled hot dogs are complimented with French fries and a cold glass of Lipton® sweet tea made with Lipton® Iced Tea Bags! 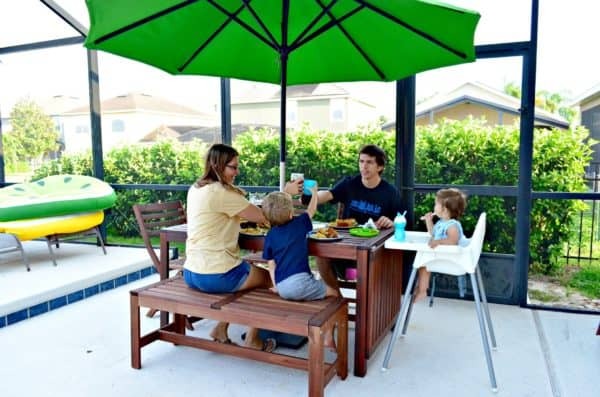 We love sitting outside enjoying our meals poolside. My son loves to toast at the beginning of our meal with a big “cheers”! My daughter is learning the ways and puts her sweet little hands up. She will be “cheersing” with us soon! If your entertaining this Memorial Day (or even this summer) make sure you head to Walmart for Tyson®, Lipton®, and Ball Park® products. Place your order online and you will find additional recipes and tips on how to master your summer! While the grill preheats, rinse and pat-dry the chicken breast. Cut the chicken in half. Drizzle olive oil on top of the chicken breast and sprinkle with the garlic & herb seasoning. Reduce the heat to low, then clean the grill. Spray with cooking spray and then place the chicken on the grill. Grill for 15 minutes, turning once. Grill until internal temperature reaches 165 degrees Fahrenheit. While the chicken cooks, slice the tomatoes, avocados, and lettuce. Place on a tray. During the last minute of cooking place the hamburger buns on the grill in indirect heat. 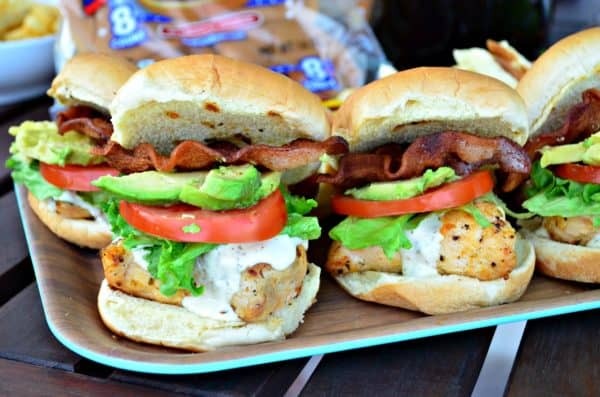 Remove the burger buns from the grill, place the chicken breast on each bun. Top with 1 tablespoon ranch, a slice of tomato, lettuce, and avocado. Repeat, until all the chicken sandwiches are done. Enjoy immediately.